When choosing an epilator, there are a few things to consider. The first is that you want to choose a brand name that has earned the allegiance of customers. This way, you know you’re getting a great product, great customer service, and easily replaceable parts. Second, the number of tweezers matter. Choose an epilator with a hefty amount of hair-plucking elements to help ensure the least amount of passes. The more tweezers, the more accurate and efficient the appliance will be. Third, choose an appliance that has top-of-the-line technology, something no other epilator on the market has. This indicates that the company has their customers in mind and that they are continually researching what works best. Fourth, you want something durable. An epilator is meant to be a long-term device, and you will want to spend good money on a piece that will last you many years with the least amount of replacements. And fifth, add-ons are always fun and can often be practical, so look for a device that comes with a few extras. Luckily, the Epil-X Luxurious Body Hair Removal System meets all of these preferences. BeautyKO is a company that produces a wide variety of items from glass bowls to elite ab transforming belt systems (and a few odd things in between). They have great customer service and very satisfied customers of all of their products. The Epil-X Luxurious Body Hair Removal System is no exception. The more tweezers an epilator has, the more efficient it can be at removing unwanted hair. The Epil-X has a whopping seventy-two tweezers, the most of any epilator, made of 24k gold. They can grasp hairs as short as 0.4mm in length directly at the root, lessening the appearance of ingrown hairs and expertly completing the job in one pass. The Epil-X has a rubber comb that gently guides flat hairs into a standing position and into the grasping area of the tweezers. This way, hairs you would otherwise miss, are effortlessly taken care of. This is a feature many epilators are employing because of what a big difference it makes to the user. Having a spotlight may seem like a silly thing to include, but you will be amazed at how much easier it is to spot light or fine hairs while working. This is another great feature that makes it possible to do a thorough job the first time around. The truth is that epilating is painful, or at least irritating, and no one wants to have to do it twice or more in a single sitting. Finding a product that is efficient enough for a one-time pass is worth the money! This expert technology allows the Epil-X to glide along any body part smoothly and allows the appliance to become perfectly contoured to your natural curves. This, again, makes it possible to complete the job in one pass. The heads also vibrate, massaging and relaxing the skin and making the process less painful and the hairs more easily removable. Titanium is a naturally rust-resistant metal. In utilizing a titanium blade, the Epil-X greatly decreases the possibility of rust, reducing the occurrence of infection, and keeps the mechanism healthy and safe for extended use. The Epil-X has two speeds that cater to different lengths of hair and accommodates all places that you would care to groom. No matter how coarse, fine, light, or dark your hair is and no matter how curvy or awkward the spot to be groomed may be, this appliance can take care of it. In addition to having two speed controls, the device has a 1.5″ design so that it can be easily used in the even the smallest areas. Because of the efficiency of the seventy-two tweezers and how close to the skin they remove the hairs, you can experience smooth, silky skin for up to six weeks after one use. The other great thing about epilators in general is that, with time, the hair will stop growing back altogether. By plucking the hair from the root, the root eventually becomes damaged beyond repair and will stop producing hair at all. This means that epilating will become less painful over time and, presumably, you will be able to stop grooming those frequently groomed spots as the hair stops growing back. Keep this side-effect in mind, however, when choosing places to epilate. If you foresee yourself wanting hair in those spots at some time in the future, perhaps you should choose shaving over epilating or epilate less often. Two of the biggest pros of this product are the number of tweezers and the materials. A seventy-two tweezer, gold and titanium epilator is extremely hard to come by. This is an incredibly durable product that will last you many years. It also employs the super helpful spotlight and massaging heads to help you get the job done the first time around and keep your skin from getting too irritated. The only drawbacks I came across are related to epilating in general. Understand that epilating is an uncomfortable process that needs to be done regularly and the skin needs to be pampered. 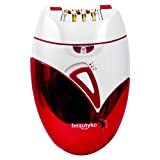 If you are not expecting the process to be uncomfortable or you do not take the necessary steps in preparing and moisturizing your skin, you will dislike any epilator byou buy. If you are willing to spend good money on a good product and are prepared for the experience of epilating, the Epil-X Luxurious Body Hair Removal System is one of the best products you can buy. It gets the job done efficiently and in the least amount of time possible, it is durable and will last you many years, and it comes from a great company. You would be hard-pressed to find a better product. If you like you can see more on our epilator review page, you can look at women’s electric shaver reviews or at home laser hair removal options you can try.